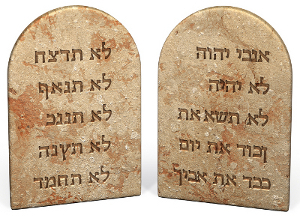 Are Christians under the laws of Moses, even partially? Does this only apply to Jews who become Christians, or also to Gentiles? And what does it mean if Christians are not under the laws of Moses, which include the Ten Commandments? Rom. 6:14,7:4,7:6 – We are not under law but under grace. We died to the law and were thus released from it through Jesus. Gal. 3:21-28,5:18 – Law and Promise are unrelated, so the failure of the law had no bearing on the promise. The purpose of the law was to serve as a manager or guide until the people of Israel had “come of age” to be eligible to inherit their Father’s estate. Now, in Jesus, there are no divisions, whether by genetics or social standing, because those who are led by the Spirit are not under law. Eph. 2:11-19 – Gentiles were never under the law at all, because they were alienated from Israeli citizenship and foreigners to the Promise. Now, through Jesus, both Jews and Gentiles are united into one new body, voiding the law of decreed commands. Col. 2:14 – The charges against people according to the law are dropped and “paid in full” through Jesus. Heb. 7:12,8:6-13,10:1-18 – The old law is superseded in Jesus, the mediator of a superior covenant. The law was a mere shadow, and was replaced. This is because Jesus is a priest in the order of Melchizedek rather than Levi, and where there is a change of priesthood there must also be a change of law. Yet Paul added something very important in Rom. 8:1, that we who belong to Jesus are cleared of all charges. Our righteousness comes not from ourselves but only and completely from Jesus. And rather than jump to the ridiculous conclusion that this means we can sin all we want, Paul explains that we cannot consider ourselves “in Christ Jesus” while also giving allegiance to sin and evil. Now some may then jump to another ridiculous conclusion: that we must do good deeds in order to be saved. Yet here again we must not confuse the means of salvation with the results of salvation. To live in sin is to deny that we have been reconciled to God. So the person who claims to want salvation yet views it as a license to sin probably has no idea what salvation is about. The entire letter to the Galatians teaches us that Jewish Christians are not to practice Judaism. Paul confronted Peter publicly about this. Acts 15 gives the account of the Jerusalem Council over the question of Gentiles practicing Judaism, and the decision was that the law was a burden no one could carry and should not be placed on Gentiles. Further, the time of the church is a time God turns his attention away from Israel. Acts 16 gives the account of the Philippian jailer, who asked how to be saved and was simply told to put his faith in Jesus. Conspicuous by its absence is any reference in any of the Letters to Christians of any ethnicity practicing the laws of Moses. So, as stated so clearly in 2 Cor. 5:17, Gal. 3:28, and Gal. 6:15, to be a Christian is to be something new, something that never existed before. And why would a Christian even be concerned about laws and regulations at all? To love and be reconciled to God is to seek to please God. And as Paul said in Rom. 13:10, love fulfills the law because it does no harm to others. If a person needs laws in order to behave properly, that person has no grasp of what it means to love and be reconciled. And if a person seeks to use laws for the purpose of controlling other people’s behavior, that person has no grasp of either love or the work of the Holy Spirit. Rules and laws are for those prone to break them (1 Tim. 1:9). Now some may concede all of this, yet insist that we keep certain “ordinances”, whether Jewish or not. Yet in citing verses that support this, other verses are ignored in spite of having equally clear commands. For example, Jesus said during the Last Supper, “Do this to remember me” (Luke 22:19). Yet he also said “You too should wash each other’s feet” (John 13:14), among other things that are not commonly practiced. The point of course in what Jesus said was that we should remember him, and that we should humble ourselves as he did. Rituals performed according to a law cannot change the heart, and if the heart is changed, there is no need for the rituals and laws. Paul listed the three groups of mankind explicitly in 1 Cor. 10:32, those being Jews, Gentiles (“Greeks”), and the church of God. Gentiles do not become Jews, in spite of the fact that so many misinterpret Paul’s teaching on the in-grafting of branches to the vine in Rom. 11. He is saying that Jesus is the vine, not that Israel is the vine, in a context about being grafted in or pruned out on the basis of faith. To ask the question, “Are Christians under part or all of the laws of Moses”, is to misunderstand the purpose of such laws, the people to whom the laws applied, and the absolute uniqueness of being “in Christ Jesus”. The laws of Moses are irrelevant to the church; what matters is a changed heart.